Point Reyes Station seems to have become one of our favourite haunts. It’s a very rural and very small town, one main street of about two blocks, with a pleasantly relaxed atmosphere and it seems to be able to meet most daily needs. 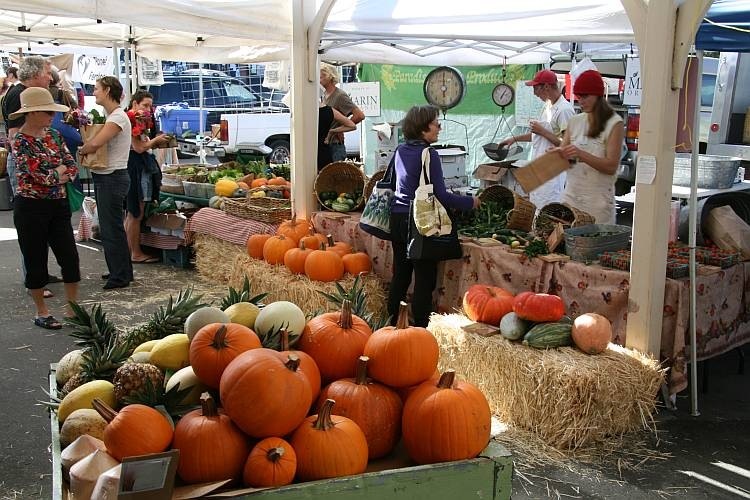 It has a reasonably comprehensive local supermarket and an intriguing sort of general store and feed barn, called Toby’s, whose supplies include an array of organic fruits and vegetables. Toby’s also has an attached coffee bar complete with entertaining stylish barista. There is an expensive local creamery, the Cowgirl Creamery, which not only makes its own array of tasty cheeses but sells a selection of European cheeses, too. The local hardware store seems to satisfy most running repair requirements and sells small Weber charcoal grills, both the rectangular portable and smokey Joe designs [decisions, decisions]. Finally, its position at the bottom of Tomales Bay seems to be out of the fog zone and basked in frequent sunshine. What more could a man want? On Saturday Point Reyes Station holds its Farmer’s Market so, once again, we popped down the side of Tomales Bay using battery power where possible to go and have a nose around. The stalls were set up outside Toby’s and, as the punters wandered around making purchases, they were being entertained by a jazz combo. We came away with some splendid young leeks to accompany some pork with a tomatillo salsa. The tomatillos had come from Toby’s a couple of days ago and I just couldn’t resist the chance to experiment with them. After returning to store our purchases, we couldn’t resist making the trip down to the Golden Gate Bridge to see the advertised arrival of The Maltese Falcon at 2:00 PM. Having seen her moored in Drake’s Bay yesterday, we really wanted to see her under sail in all her glory. I suspected that the crowds would be horrible but this was a once-in-a-lifetime chance so we set off to the Marin headlands to arrive just after 1:30 PM. We’d driven in blazing sunshine and as we exited the tunnel just north of the Golden Gate Bridge itself, there it was: fog. Unbelievable! San Francisco’s coast on the south side of the bridge was swathed in the stuff. Fortunately most of the bridge and the approaches were clear but conditions weren’t the greatest. I was, of course, quite right; the crowds were considerable and parking on the twisting road up to the Golden Gate National Recreational Area overlooking the approach to the bridge was at a premium. All the most advantageous spots had long been taken but we managed to find a space in one area and joined everyone else with their cameras at the ready. After a bit of a wait at about 2:15 PM we saw the fire boat with hoses jetting arcs of water appear round the headland. 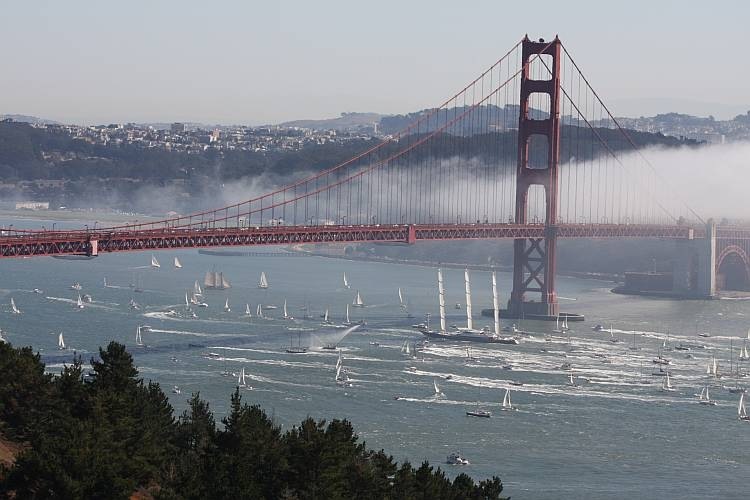 The fire boat was shortly followed by The Maltese Falcon herself in the company of San Francisco’s flotilla of smaller craft many of which had gone out to accompany her in. With no rigging in the conventional sense, she presents very clean lines. Almost too clean, really; I can’t help but think there is a little character missing because of it. She made a very impressive sight under full sail nonetheless. 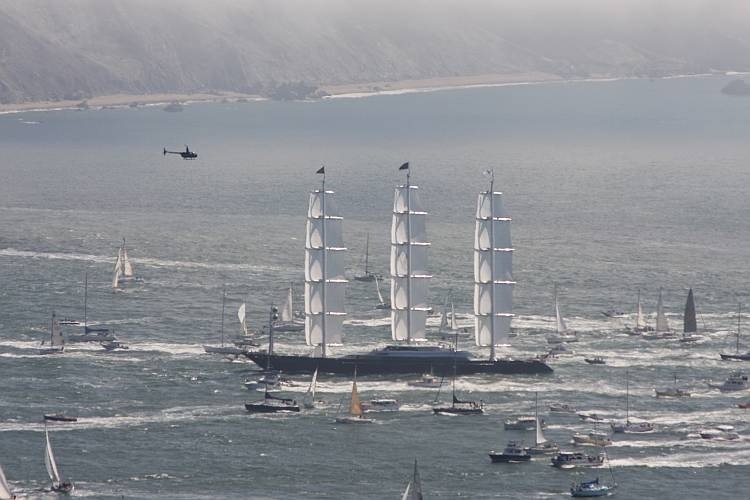 Naturally, after The Maltese Falcon had gone under the Golden Gate Bridge and entered the bay. almost all the spectators wanted to leave at once so a long line of vehicles formed snaking its way back down to the freeway. After half an hour or so we were back on US 101 and heading north, our curiosity sated. It wasn’t too painful and it was certainly an opportunity we didn’t want to miss.